Red or brown stains on your fixtures? Metallic taste to the water? Rusty water running from your tap? Diamond H2O® has your solution. The Patented Liberator Iron Removal filter will give you years of iron-free water. Not only will this filter remove the iron that has been plugging your pipes and staining your fixtures, but it will do so without any chemicals. With our patented design, the Liberator IR™ adds air as needed to oxidize your incoming iron. The iron then travels to the filter bed to be easily removed, resulting in clear, iron-free water! 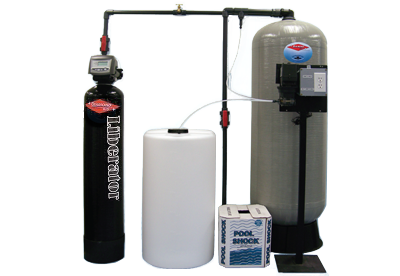 The Diamond H2O Filter System produces high quality acid neutral water. Acidic water (less than 7 pH) can have a number of undesirable effects. It can lead to leaching of metal pipes. This can give the water a metallic or sour taste, and can even cause various health problems due to higher concentrations of the metals (copper, lead, and zinc) in the water. Aesthetic problems such as staining to your laundry, sink, and drain are also common from acidic water. Diamond H2O Filter Systems utilize calcite to neutralize acidity. Calcite is a crushed and screened white marble media used to neutralize acidic or low pH water. Acidic waters, on contact with calcite, slowly dissolve the calcium carbonate media to raise the pH. The sacrificial media will have to be periodically added as it dissolves. Calcite increases hardness and a water softener may have to be added after the neutralizing filter. 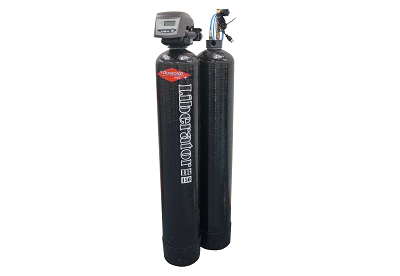 Filters using Calcite work best when the alkalinity is less than 150 PPM and Total Dissolved Solids (TDS) less than 250 PPM. Consult the factory if the influent water alkalinity is higher. Calcite filters will provide 30 – 40 micron filtration. Provides Protection for Plumbing, Fixtures & Appliances. Low Operating & Maintenance Costs.